Facebook CEO Mark Zuckerberg. Photo: Rodrigo Buendina/ AFP/ Getty Images. Facebook’sQ3 revenue grew 33% year-over-year, but came in slightly below Wall Street targets. 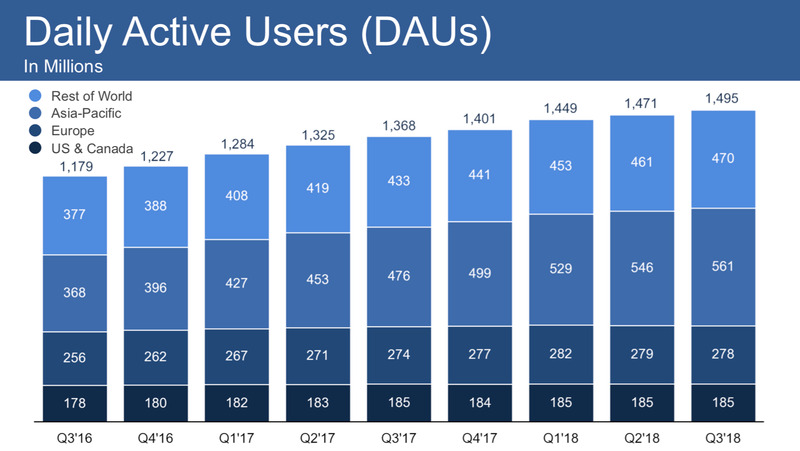 Facebook’s US DAUs in Q3 were flat from Q2 levels, at 185 million users. The fact that daily active users in the US didn’t decline after a string of scandals appears to have come as a relief to investors. Facebook’s revenue came in lighter than expected during the third quarter, but Wall Street breathed a big sigh of relief that users in the US did not flee the social network in droves after a string of scandals. 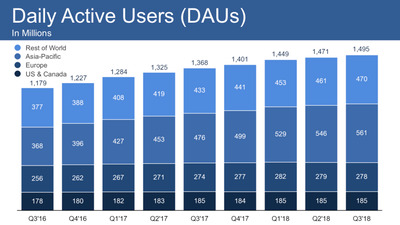 Facebook’s daily users in the US – its most valuable market – flatlined at 185 million during the three months ended September 30, the same level as at the end of Q2. Not long ago such a lack of growth would have been considered a big cause for concern among Facebook investors. But in a sign of how low the expectations have become, investors celebrated the fact a feared user exodus did not materialise. Facebook’s share price see-sawed wildly in extended trading on Tuesday, dipping as much as 6% and climing around 5%. As of writing, it sits around 3.6% up from its Tuesday close. On a conference call with analysts, Facebook CEO Mark Zuckerberg talked broadly about Facebook’s strategy, positioning its current challenges as part of a generational shift akin to its shift from desktop to mobile years earlier. This time around, Facebook is shifting from “Feeds”-based products to “Stories” – ephemeral photos and videos that disappear after 24 hours. Yahoo FinanceFacebook’s stock fluctuations on October 30, 2018, as it announced its Q3 2018 financial results. The company, once loved by Wall Street for consistently outperforming, turned in a Q3 report that had a few blemishes. Revenue grew 33% year-over-year to $US13.7 billion, but fell short of the average analyst expectation of $US13.8 billion. The company says foreign exchange headwinds totalled $US159 million – more than enough to cover the amount Facebook missed revenue expectations by. Facebook’s operating profit margin fell to its lowest level in six quarters, at 42%. At this time last year, its operating margin was 50%. Although earnings per share comfortably beat Street estimates – $US1.76 versus $US1.47 expected – Facebook noted that it benefitted from a lower than expected tax rate. The stock initially dropped more than 5% after Facebook published the results, before rebounding, and as of writing it hovers at around 1.5% in the green. FacebookFacebook’s daily active user numbers for the past nine quarters, broken down by geography. Daily Active Users in the US and Canada have now flatlined isnce Q1 2018 at 185 million – but that may come as a relief to investors that the company is not actively shedding users as a result of its tumultuous few months. Facebook is continuing to battle crises and repututional damage from multiple scandals, including Cambridge Analytica and the hack of 30 million users’ sensitive data. 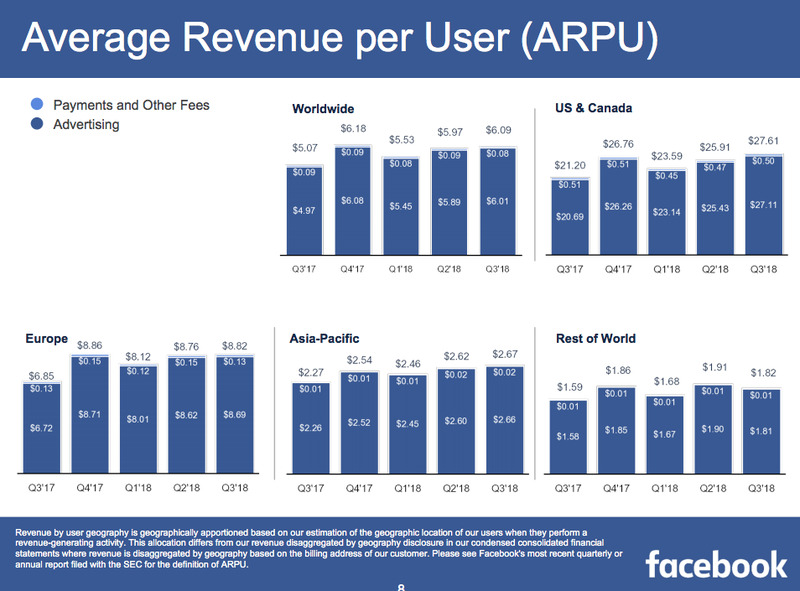 The US and European markets are the most important to Facebook’s current business, since it can generate more ad revenue from the relatively affluent users in those regions. 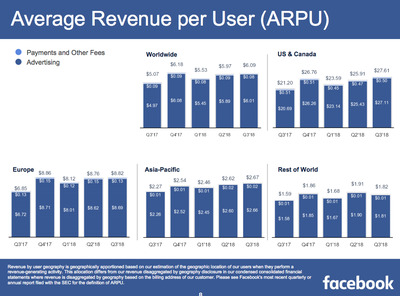 As the chart below shows, Facebook’s average revenue per user in the US and Canada region in Q3 was more than 10 times higher than its average revenue per user in the Asia Pacific region. Most analysts remain optimistic on Facebook, despite its recent travails. Prior to market close, there was a consensus price target of $US203.26, according to Bloomberg – up significantly from Tuesday’s share price of around $US146. The stock’s all-time high is around $US210. The company’s stock dropped 20% on its Q2 2018 earnings in July, when it failed to meet analysts expectations and warned that revenue growth rates were going to drop. Business Insider is covering Facebook’s Q3 2018 earnings live. Refresh this page or click here for the latest updates. Got a tip? Contact this reporter via Signal or WhatsApp at +1 (650) 636-6268 using a non-work phone, email at [email protected], Telegram or WeChat at robaeprice, or Twitter DM at @robaeprice. (PR pitches by email only, please.) You can also contact Business Insider securely via SecureDrop.